Inside View of St Botolph's Priory at Colchester in Essex. bl.uk > Online Gallery Home	> Online exhibitions	> King George III Topographical Collection	> Inside View of St Botolph's Priory at Colchester in Essex. Interior view of the impressive ruins of St Botolph's Priory in Colchester in Essex. As can be seen from its ruins in the picture, there was once a considerable early Norman Church here. St Botolph's Priory was founded in the late 11th century as the first British house of the Augustinian Canons. The church was built of rubble and also Roman bricks, brought from nearby Roman ruins in Colchester. This picture shows, from the inside, the surviving west front and part of the nave. The transepts and east end were no longer standing. 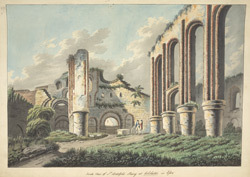 By the late 18th century, the ruins of medieval religious houses were fashionable and picturesque places to draw.